D you wonder why others are getting more traffic? and why you are struggling to get traffic from Social-media sites? Today I will discuss one important part of the blog post which will help you to get more traffic for your articles. Blogging is not just a text written on a page but it also include a good combination of multi-media, images and text. If you see my earlier posts, you will see that I use atleast one image on each of my blog post. Reason is because image speaks thousands words. Visual content attract more visitors as it make post looks visually appealing. Today I will talk about the reasons why everyone should start using images in their blog posts. I will also discuss about the cutting-edge tips to help you to choose the right-image. 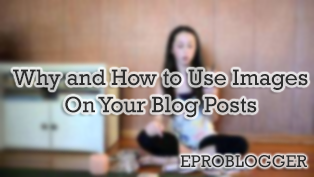 Why you should always use image in your blog post? Image make your article look visually appealing. It is said already that “A picture speak thousand words”. Image convey the message of your article. Always use images which are related to your article. Every blogger use popular post or related post thumbnail and these thumbnails use the image of the post. This increase CTR and decrease bounce rate, which is good for you. Images also attract traffic from image search engines. You should use Alt tag and description for images to attract visitors from image search. I optimize all images with Alt tag. You can use SEO friendly image WordPress plugin to optimize images for search engine. This is Social-media era and users of social media love visual content. It not only compel users to share articles but also helps you to drive traffic from social media sites. Make sure that when anyone share your post on social media site then right image also get share. Your images should be of good quality and attractive. You can also use Social SEO pro plugin to choose the right image which will be shared on Social media sites like Twitter, Facebook and Google plus. Image also make your article look lengthier. It help you make your article look more detailed. If you are doing short post than images will definitely help you. Images are easy to remember like a child who learn A for "Apple" and see image of apple to remember what A represent. Write a tutorial post which is short then few screenshots will help your reader to understand tutorial easily. Image size is an important factor. Always resize images before uploading. There are many tools available online to resize images. I also recommend everyone to resize their images before uploading it to server. You can also use WP Smush.it plugin to automatically compress images. Things you should know before using images on blog post. Don’t use Google image search, to find images for your blog as this way you may be violating someone`s copyright. Consider creating your own images. This is a good plugin which take care of all image needs. This is a premium plugin. It help you find free to use images. Watermark plugin help you to create your own images. It automatically adds a watermark to your images. You can easily find free images from Flickr which are under creative common license. You should add images in all your posts. You will be surprised to see the result. It not only increase social media share but also give a good user experience. I hope these tips help you to understand how important is an image for blog. If you find this article useful, do share it on facebook, twitter and Google plus. Don`t forget to like us on facebook, twitter and also subscribe easkme newsletter to get free updates.